Tamp the berries down into your blender then add the water. Start on a slow speed. Blend until the berries are soaked. If you don’t have a blender, muddle the berries and water in a jug and let it sit for a few hours or overnight in the fridge. With either method, strain at least once through a sieve and/or cheese cloth to remove the fine hairs surrounding the berries. Sweeten to taste. Sumac shrubs grow in dry, rocky and/or sandy areas. First, find yourself a nice crop of staghorn sumac. 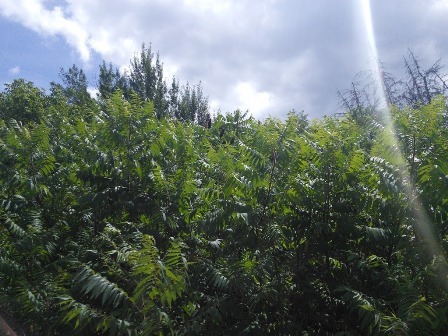 You can’t wash sumac berries or they lose their flavour, so look for the shrubs away from heavily trafficked areas as the berries will be cleaner. They’re best picked starting in August and continuing into early autumn. If there isn’t much rain in the fall you can sometimes continue to pick through the winter but by then the birds have usually gotten to them. Ripe sumac berry clusters or heads are usually deep purple (no, not the Smoke on the Water kind) but sometimes a red one can fool you and is just as ready to rock & roll. The reverse holds true for the purple ones; they may look ripe but are they? Before cutting any cluster, break off a few of the berries. The easier they are to break or fall off, the riper the berries usually are. Crush a couple between your teeth; you should get a hit of tart if the fruit is ripe. If it is, and the rest of the cluster looks good (no insects or obvious defects) cut the cluster off at its base with a sharp knife or scissors. Storage tip! Store the clusters in a basket, or a fabric or paper bag until you get them home. Unless you are picking from your own backyard and can transport them quickly, never use plastic bags; moisture is the enemy and the fruit will lose its tarty goodness. As with most other fruit and veg, sumac is best used the day it’s picked. Sumac abounds in my area so I don’t worry about over harvesting but I still only take 1-2 clusters per shrub, depending on its size. Sumac is a good food source for birds and animals and I don’t want to be greedy. Use good judgment when harvesting any plant and follow the rules of foraging. Depending on their size, 7-10 clusters will give you enough berries (about 3 cups or so), along with 4-5 cups of cold water, to make a nice jug o’ juice. More berries to water will, obviously, produce sourer juice. Can you take the tart? Can ya? Please give that delightful noggin of yours a workout and do your own math if you want to make more or less juice or if you want a tartier beverage (merely slipping fishnet stockings over the heads doesn’t count). I like playing with my food and encourage people to have fun and experiment with amounts. 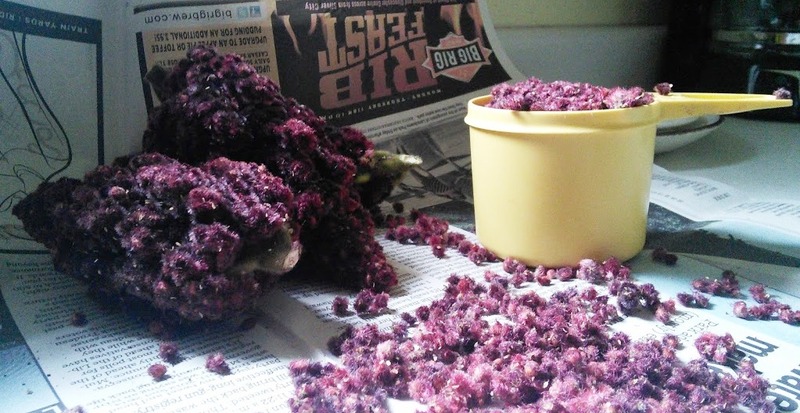 In a large bowl or basin or over newsprint, rub two of the clusters together, not too vigorously or the berries will start flying all over the place. I can imagine that this is a task many children would find amusing. Like rubbing two cats together but without all the yowling and face scratching. Continue to rub the clusters (sensually if you must, but not in front of the children please) until all of the easily loosened berries have fallen into or onto whatever surface you used. Compost the heads. If you don’t have composting where you live, how come? No blender? No problem! Use a juice jug and a wooden spoon. Get all the day’s frustrations out—take that 78-day election campaign!—by mashing and muddling the fruit and water together in the jug and letting the juice sit for a couple of hours or overnight in the refrigerator before straining. Spend a few moments pondering the word “muddle”. 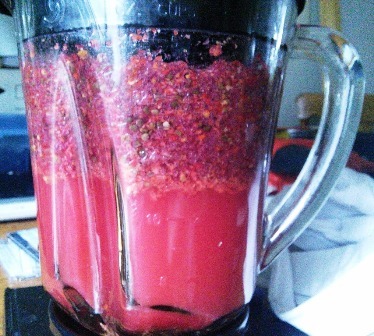 If you have a blender, tamp the berries down into the bottom then add the water. Now, if you have a temperamental blender that likes to spew out stuff despite the fact that you are using a brick to keep the lid on it, you’ll want to start on the slowest speed. You can soon work your way up to pureeing, don’t worry. Whiz it all together until the berries look well sodden. They’ll float to the top. This is all perfectly normal; don’t panic. Strain the juice at least once through a sieve and/or cheese cloth to remove all the little hairs that surround the berries; they won’t hurt you but they can be an irritant to some. 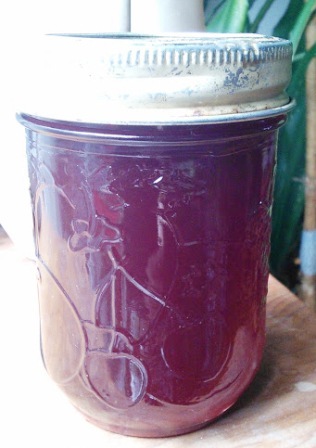 While making this juice I discovered that I had only a small scrap of cheese cloth left, so I lined a fine sieve with it then used an onion bag (handy things to have around) and poured the whole mix into it. 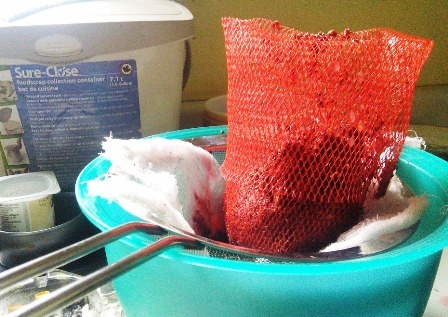 The juice flowed through the bag, the cheese cloth, and on through the sieve. Triple the strain, with none of the pain. Sweeten to taste with whatever you like, but not too much. Too much sweet stuff is bad for you (nag, nag…) Sumac juice with or without sweetener works in cocktails, wherever a simple syrup or lemon/lime juice would normally be used. …but we’re not done yet! Since sumac syrup can be used for all kinds of desserts and breakfasty-type items, here’s a special bonus recipe! In a pot over high heat, dissolve the sugar into the juice. Boil it until you can stir it with a wooden spoon and the mixture continues to boil around the spoon. Reduce to medium-high heat to keep it simmering. 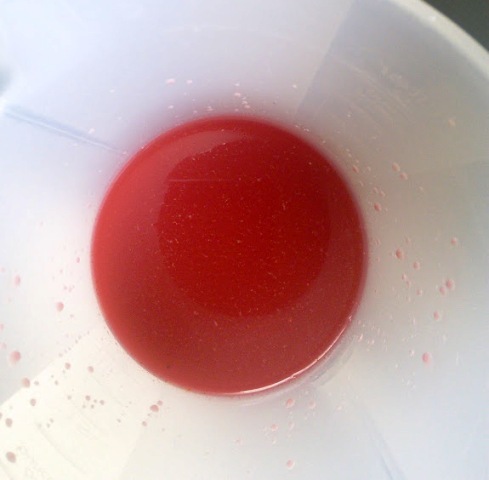 A: If you want thick syrup that takes less simmering time, increase the ratio of sugar to juice a bit a time. Simmer to the desired thickness. B: If you still want thick syrup but don’t want to add more sugar, simmer it for longer (up to 30 minutes). This recipe, with a 30-minute reduction, produced 1 cup of thick, honey-consistency syrup. In both cases, let the mixture occasionally boil up to speed reduction time but keep stirring it so that it doesn’t burn. On that note, it’s a good policy to never turn your back on any syrup making endeavours…this is how most people get into sticky situations. ← Change is risky. Stagnation kills. If you’re into foraging, you won’t want to miss Sumac season! Here’s a great article about foraging the plant, where to find it and how to use it. It even includes a great recipe for making Sumac juice!